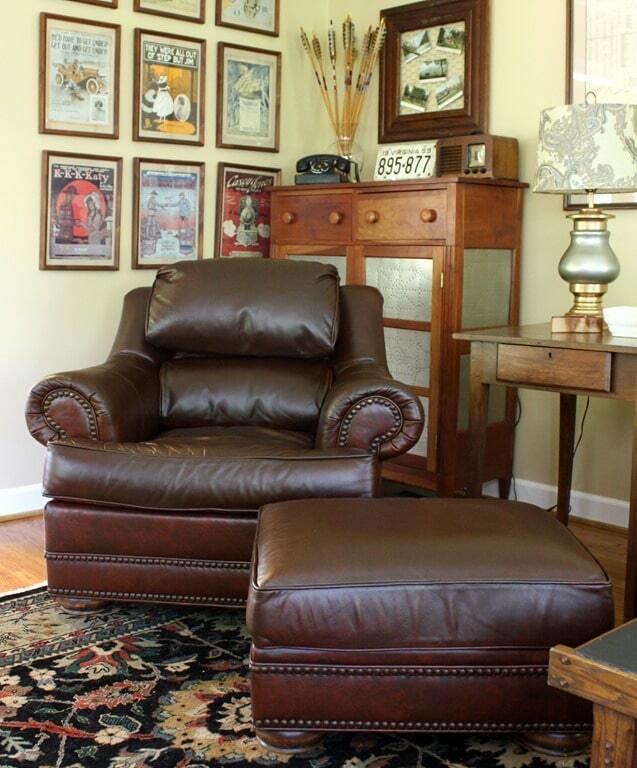 How many of you have a piece of leather furniture that has seen better days? 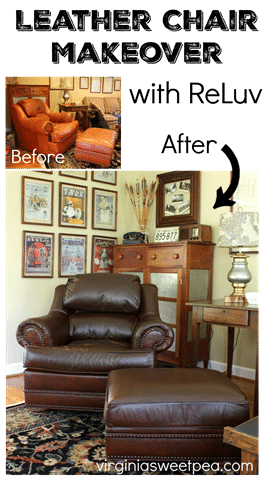 That was the case for a leather chair and ottoman that we purchased nearly 20 years ago. 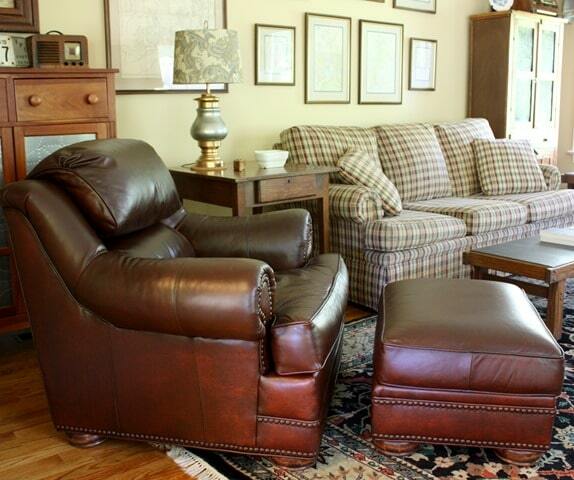 This King Hickory set has had daily use in our family room and while still quite comfortable, it looked worn and shabby. Buying a new set was not in the budget, so I used ReLuv Leather Renew from Heirloom Traditions to make it look like new. Isn’t this an amazing transformation?? My chair and ottoman look like new. Would you ever guess that this is a 20 year old chair? The chestnut brown color gives this chair and ottoman a more modern look as well. 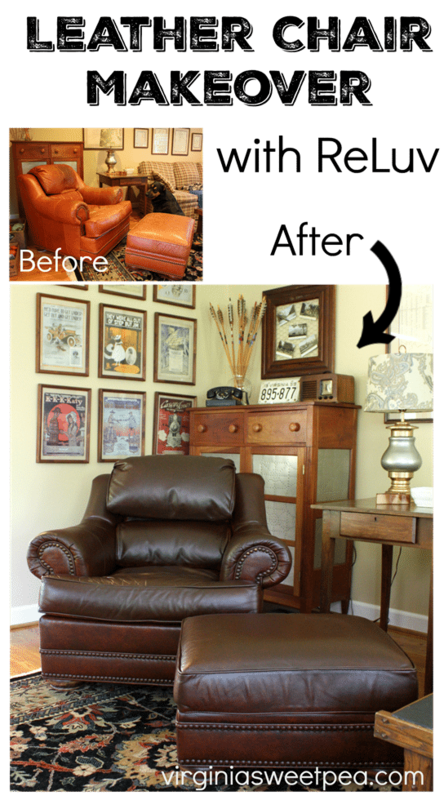 All that was needed to complete this project was ReLuv Leather Renew, chip brushes, and rags (I used old t-shirt pieces). I ended up needing a second can of ReLuv because one wasn’t quite enough to complete both the chair and ottoman. I purchased a six pack of chip brushes and used all of them since I worked on this project in stages. I had to borrow a ReLuv picture from Heirloom Traditions because I accidentally deleted the ones that I took with my camera. 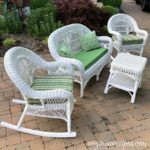 I took video as I completed this project and I hope you enjoy watching the transformation of this chair and ottoman. 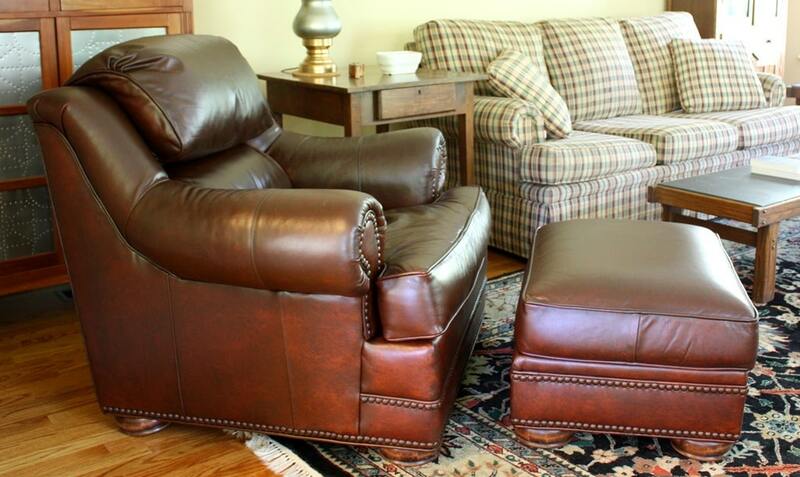 Are you wondering if our chair and ottoman still feel like leather? Yes, they do. They aren’t quite as soft as they originally were but I just finished this project and it’s possible that it will soften with use. Would I use ReLuv again? Absolutely. 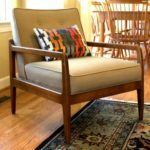 I went from wanting a new chair and ottoman to being perfectly satisfied with the one I have. Adding poly-fil stuffing to the chair’s back cushions beefed them up a bit. Our seat cushion was still comfortable, so I didn’t add poly-fil to it. Isn’t this transformation amazing? I’m so happy that I discovered this product. 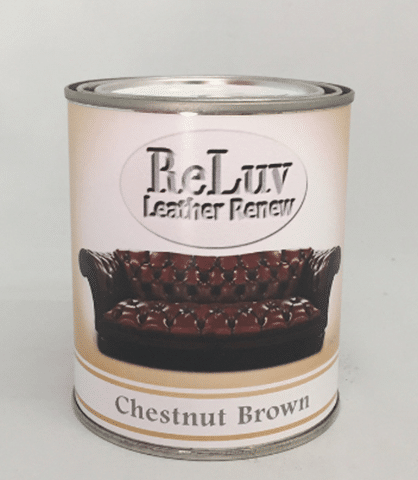 If you have a leather piece of furniture that has seen better days, consider using ReLuv to give it a fresh look. I am 100% pleased with my chair and ottoman post-makeover! If you like this post, please pin it for others to discover! Are you ready to try ReLuv? I am so happy that I discovered this product! Wow Paula! That is amazing. What a great save on the chair. 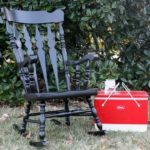 I have seen leather chairs painted with Annie Sloan Chalk Paint, but I prefer what you did. Well done and thanks for spreading the word. I didn’t know such a product existed. That looks wonderful. 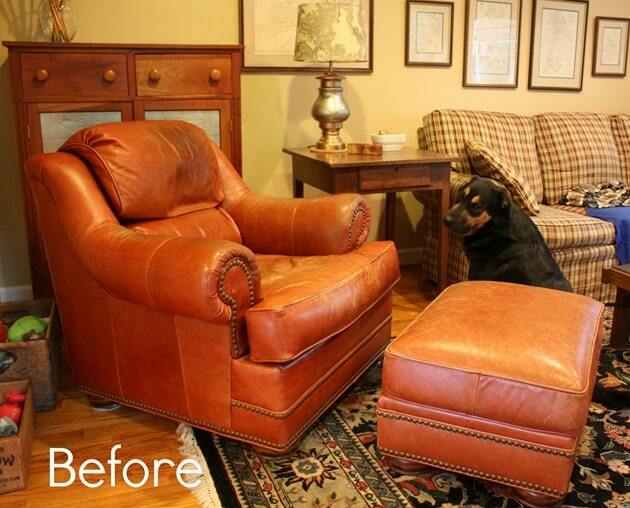 Such a great way to update old leather furniture. Oh my goodness! That’s an amazing update. Love the new deeper color! Thank you, Ashley! I think that the deeper color gives this set an updated look. Wow! That is a big difference. This would be perfect for making over thrift store finds I bet, too! Good idea, Ginnie. Now when I see leather in the thrift store I won’t automatically walk past it like I usually do. Looks fantastic! 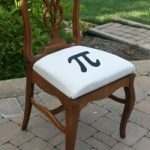 Did you do any type of prep to the chair before starting with the Reluv? I watched your video but you hadn’t mentioned anything. Where can you purchase the Reluv? Hi, Lisa! All I did to prep the piece was wipe off some dried food that was on the arms. Other than that, I did no prep! Whoa. I am legitimately impressed with this makeover. It looks brand new!! I had not idea they had a product like that. So cool!! Just curious, were you paid by The manufacturer to try this product and do a post? 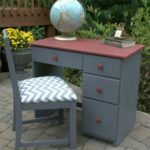 Your furniture looks great! Hi, Lola! I was not paid but they did supply the product for my project. Thanks so much for the compliment. I’m thrilled with how my chair and ottoman look now. Thank you, Laura! I’m so pleased with how this turned out. I have to say this is one of the most impressive transformation I’ve ever seen. It’s awesome. I don’t have any leather chairs but my grandparents do. And I think I may give them a look at this. Thanks a lot for sharing. It is a big difference between before and after. 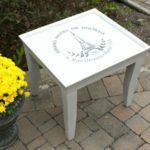 Good idea to refresh our furniture. The house will be more beautiful with new decoration like this. Thank you very much for sharing. The transformation is definitely amazing. The chair and ottoman look like new. 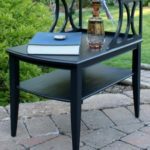 Such a good way to renew our old furniture without having to throw it away. Good job, Paula! interesting! It looks great! I’ve never heard of this product, what a great tip. Wow, such a great transformation!! Btw, thanks for the guiding video, will definitely try on changing my own couch at home !!! interesting! i’d love to see a piece on how to clean leather too! it’s really tricky! Absolutely amazing. What a transformation. Thank you for sharing at Snickerdoodle Create~Bake~Make link party! This is amazing!! Love the rich new color and the best part is you saved big. I love old leather and your set will be able to tell stories. Yay! Thank you! We like the new look so much better! 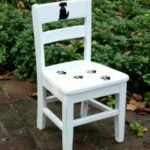 Can you tell me if the color came off on your hands, clothes etc after you used the chair? I have an expensive sectional that the sun faded just parts of it. I would love to try this product on it, but don’t want to ruin it so that we can no longer sit on it. Thanks for sharing! This product is awesome, Kelly! After it dries it does not come off on your hands or clothes. My dog sleeps in this chair and a year later his claws have left scratches on the chair seat but the rest of the chair looks exactly like it did when I completed this project last summer. 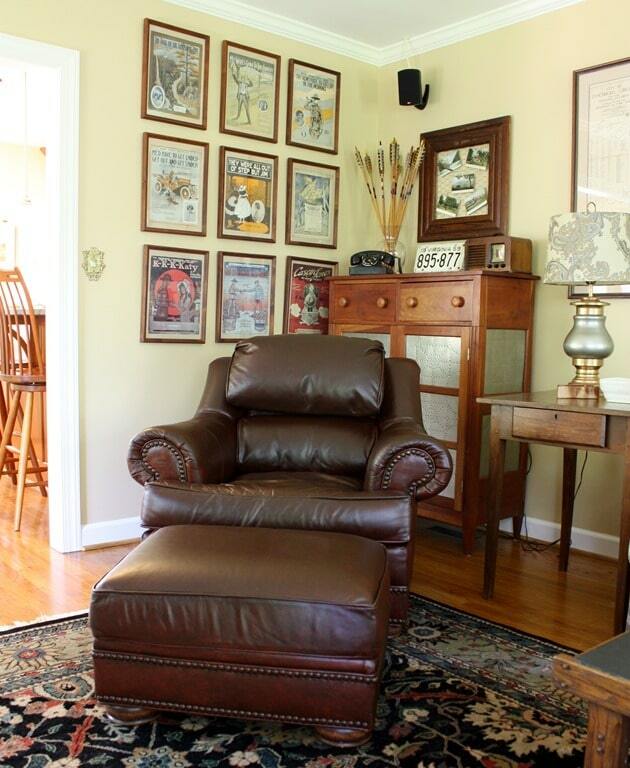 I plan to take the chair cushion down to the basement and give it a touch-up very soon.